February 4, 2015 - Chakra Tuning and massage. 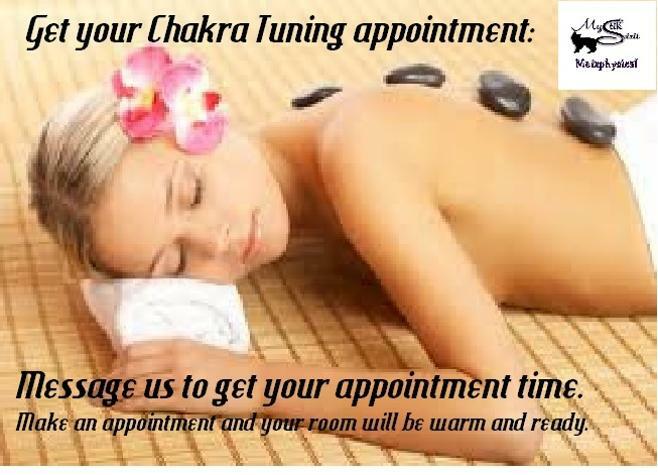 The Chakra Tuning Massage, a menu item that includes deep-tissue massage, foot reflexology, and subtle energy work. This ritual connects clients with something familiar like massage, while also introducing them to the less well-known aspects of energy work. As a result, clients come away with a greater appreciation for the interwoven aspects of their mind, body, and spirit, and a greater sense of participation in their healing journey. This is taken from the Aveda Spas page and they have over 7,000 spas world wide. The idea of a massage to relax the body goes into the ability to actually put the client into a meditative state so that the chakras can be tuned without interference of stress. Michael's Chakra tuning massage starts with a relaxing binural beat that relaxes you with music. Hot mineral oil massage is used to relax the client and put into an extreme meditative state. Foot reflexology is used so that various health issues may be able to be helped to heal. Then, using aromatherapy, and gemstones on the proper chakras, we use tuning forks to help them align. Tuning forks are used for healing because of the vibrations emitted when struck. When a tuning fork is struck, not only does the fork vibrate, but also the surrounding air space with the same frequency of vibration. The vibration alters your body’s biochemistry and brings your nervous system, muscle tone and organs into harmonic balance. Many people have gotten their first tuning and felt completely different when leaving. The total relaxation, and the clarity of the chakras being tuned. Many clients need to return, because it did not take a short time to get them unaligned, and it make actually take a while, usually not more than 90 days to actually get them aligned and tuned, and then a monthly tuning to keep them going strong. Kundalini energy flows into the seventh chakra at the crown of the head and moves down the sushumna nadi to the first chakra. This descending or manifesting current of energy moves us from the world of mind and spirit and helps us manifest ideas into the physical world. Anytime you help manifest something in your life, you are using the manifesting flow. For example, at some point in time you thought, "I want to be a massage therapist." You took that idea, researched and chose a school, rearranged your schedule, found financing, and then studied and participated in the program to make that initial thought a reality. This is using the manifesting descending flow of energy in the chakras. Michael Blue Eagle operates with the seven basic chakras that are used elsewhere, but we also use the four "godhead" chakras above the Crown, and the half chakra at the knees, and the Zero chakra at the feet. We believe that the energy from the Godhead, Divine Spirit is brought through the four chakras, through the main seven on the body, through the knees and feet for grounding, and then come back up, reflecting what's inside the body, through Aura. So by connecting the Godhead chakras, and clearing and tuning the rest, not only will your body be in sync with the Gaia vibration, and you will become on the road to health and love with everything aligned and tuned.